Muhammad Ali. Abraham Lincoln. George Clooney. Diane Sawyer. The big thing that all these famous names have in common is that they all call the same state home: the state of Kentucky. As the 15th state to join the Union, Kentucky has had a long history, with records dating as far back as the 10th century. It was not until later on in the 17th century that French explores made landfall and began documenting the land for themselves. Over the subsequent years, Kentucky became a plantation state, with plantations dedicated to tobacco, hemp, and livestock. It was a border state during the American Civil War and attempted to maintain neutrality, until the Confederate army entered in 1861, followed by the Union army. Today, when somebody mentions the Bluegrass State of Kentucky, there are probably many things that come to mind. There is the world-famous Kentucky Derby horse races, various big-name bourbon distilleries, the Kentucky Wildcats college football team and, yes, Kentucky Fried Chicken. But, they are also known for so much more than just the things mentioned above. What you may not know is that Kentucky is even known for some auto manufacturing. So it only makes sense that car shipping is a popular method for handling cars and moving them to and from different areas of Kentucky. Here is what you should know about the beautiful state of Kentucky and shipping cars to and from, for whatever reason. There are many popular and well-known cities in the state of Kentucky, each offering something unique to residents and visitors alike. The city of Lexington, Kentucky, sometimes called Lexington-Fayette, is the second largest city in the state. The city of Lexington has been deemed the “Horse Capital of the World” due to the number of horse farms, and you will find, including the famous Kentucky Horse Park, a horse farm that is open to the public for tours and visiting. There is also Keenland professional horse racecourse, which is open to the public and provides a look into the history of thoroughbred racing and the culture surrounding it. Lexington is also home to the historical Mary Todd Lincoln House, originally built between 1803 to 1806 and was the childhood home of the future First Lady, before becoming an inn in 1832. Other historic sites include the Lexington Cemetery, a public cemetery established in 1849. Beyond that, Lexington, Kentucky is also home to the University of Kentucky, one of the most well-known universities in the state and a tourist destination in itself. Louisville is the largest city in the state, and the most well-known. You may recognize it as the home of Churchill Downs, the home of the legendary Kentucky Derby horse races. But, that is not the only thing that Louisville is known for when it comes to popular attractions. You can also find the state-named amusement park, Kentucky Kingdom, which is home to different thrill rides, a water park, and more family-friendly fun. You can also check out the Louisville Zoo and Louisville Slugger Museum & Factory. Beyond all of this, Louisville is also one of the cities in Kentucky known for auto manufacturing. Here you can find the Kentucky Truck Assembly plant and the Louisville Assembly Plant, which belongs to the Ford Motor Company. In Louisville, you can also find various Kentucky universities, including the University of Louisville, Bellarmine University, and Spalding University. Then there is the city of Bowling Green, Kentucky, which was made the capital of the Kentucky Confederacy during the Civil War. Today, it is the third largest city in the state and is home to many big-name manufacturing plants, including the Fruit of the Loom Company and the well-known car company General Motors. Here, you can also find the Bowling green Assembly Plant, the location where the Chevrolet Corvettes have been in production since 1981. But, Bowling Green does not just have manufacturing plants. There are many great attractions for people to visit and explore, like the National Corvette Museum, where you can see the history of the Corvette and the Lost River Caves, a network of limestone caves families can explore via boat tours. There is also the Beech Bend Amusement Park which also includes campgrounds and a race track. In Bowling Green, you can also find Western Kentucky University, South-central Kentucky Community & Technical College, and Daymar College. There are many different reasons why you may want to transport your vehicle to another location. Whether you are looking to transport it somewhere in Kentucky, like Louisville or Bowling Green or to a whole different state, many companies would be happy to transport your vehicle for you. Of course, the most common reason people want to ship their cars to Kentucky is because they are moving. Whether it is from another city within Kentucky or from out-of-state, people are always moving somewhere. But, not everyone wants to sell their car when they move. They also do not necessarily want to drive their car all the way to their new home. Driving such distances can become incredibly expensive between gas, tolls, food, and even hotels if you are coming from a farther distance. Shipping a car provides a more comfortable and more cost-effective alternative, that allows you to keep your same vehicle. Students need some sort of transportation. If you are coming from out-of-state or a farther distance, universities usually allow you to bring your car. But, driving is not the best idea and can be harmful to your car. Instead of putting your vehicle through that sort of stress, you can ship your car to the university to have it with you during your time there. That way, you will not have to rely on public transportation or your friends to get everywhere. In Kentucky, you will find Fort Knox, one of the many military bases in the United States. Soldiers are always moving to and from the base and may need their cars to move with them, so they likely will turn to an auto shipping service as an option. The military may also need assistance in transporting certain vehicles to and from the base. Kentucky is a state that loves cars, as noted by having assembly plants for various companies throughout the state. So, it would make sense for them to like car auctions as well. But, you cannot expect auction cars to drive to the winner’s location—that could be difficult and expensive, and sometimes impossible if the car is not in full working order. An auto shipping service shipping helps to eliminate these issues by allowing auctioneers and buyers to ship a car to the desired location. Another scenario where car shipping comes in handy is with car dealerships. Once cars like the Corvette have finished going through the manufacturing process and are ready for sale, they must get transported to various car dealerships around the nation. An auto shipping service can make this process extremely easy by loading up multiple cars and taking them to the right location all in one go. There are two main types of car shipping that you can consider when it comes time to transport your vehicle: enclosed shipping and open car shipping. Each one has its benefits, and there are different reasons to choose each. Enclosed Car Shipping is an option reserved for special cars. Sports cars like the Chevrolet Corvette, classic cars, and motorcycles all benefit from enclosed shipping. These are vehicles that require more care and protection, especially when they are moving over large distances. With enclosed shipping, the car is inside of a special shipping container which protects in from the various elements—wind, rain, and snow—and also from potentially damaging road debris. With enclosed shipping, you can expect to both pay a little more and wait longer for your vehicle to arrive, but it would mean that it is much safer during transport. Open shipping is the other primary option to ship a car and is what transport companies use for everyday cars like SUVs, sedans, and similar vehicles. 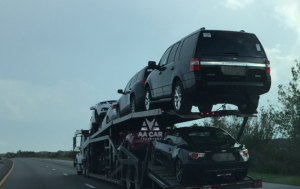 With open car shipping, multiple cars go onto the back of a truck for shipping to different locations. Unlike enclosed shipping, open car shipping is, as the name implies, open. That means the cars on the back of the truck get exposed to wind, rain, snow, and road debris that may result from construction zones. This form of car shipping is cheaper than enclosed shipping, and you can expect your car to arrive much quicker. Your car is important to you, and car transport companies recognize this. When you are moving, be it to live permanently in a new place or temporarily due to the military or college, you will not want to be without your vehicle. Driving it to your new home can prove to be very expensive and harmful to the car. For that reason, the best option is to ship a car instead: it will help get your car to you much faster, without all the wear and tear that would come with driving it. You will not have to worry about waiting for it to arrive either; it will get there at the same time that you do, making you ready to go out and explore immediately.